When it comes to summertime fun, not every town is satisfied with state fairs and carnivals. These intrepid communities celebrate quirky bits of history and time-honored traditions that make simple petting zoos seem boring. While some of these festivals might look bizarre at first glance, they serve the same purpose as the more run-of-the-mill gatherings: Get a bunch of people together to have fun. It's been over 250 years since the 4th Earl of Sandwich “created” our favorite lunchtime menu item. Celebrate this momentous occasion by heading to Kent, England for the Sandwich Celebration, which will feature dramatic reenactments of the first sandwich’s creation and sandwich making competitions. New Yorkers give their best Ariel impressions at this annual opening to the summer season. Local celebrities lead the Coney Island Mermaid Festival as King Neptune and Queen Mermaid; past kings and queens have included Lou Reed, David Byrne, and Queen Latifah. Whether or not you believe that a spacecraft crashed in the New Mexico desert 65 years ago, you're sure to enjoy the pet costume contest, a parade, and alien-themed events that beam in for the Roswell UFO Festival. Forget the Running of the Bulls in Spain – head to New Orleans July 11 for San Fermin in Nueva Orleans to compete with over 10,000 runners in a New World replica race, except that the "bulls" are actually members of the Big Easy Rollergirls. 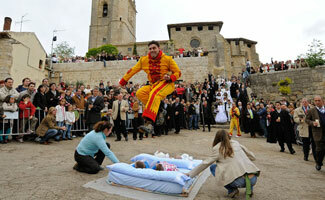 Elvis-like impersonators play hopscotch over babies in Castrillo de Murcia of Spain at this bizarre festival (El Colacho). The 400 year old act comes with a spiritual purpose; in jumping over the babies, you are cleansing them of any evil that exists in their souls. Parental consent is, of course, needed to participate. Take the ferry from Vancouver to Nanaimo on Vancouver Island to witness the World Championship Bathtub Race. Residents have been motoring their souped-up tubs along the 36-mile course since 1967. Competitors from across Australia flock to Alice Springs in the Outback for the Henley-on-Todd Regatta, which features races in dry riverbeds, bottomless "boats," and "sand skis" before the epic boat battle ends the festivities. Taking the country by storm is the most colorful (and touted as the most happy) 5K on the planet. The Color Run is an un-timed, paint run for charity and starts runners off in all white, only to finish decked out in color from head to toe. You must register for this event in your chosen city. Sample insect-infested food like Mealworm Maque Choux and Lemongrass Toasted Waxworm Spring Salad at BugFest in Raleigh. Nocturnal insect tours, educational arthropod presentations, and sessions on how to keep a beehive are also offered. What is the craziest festival you've ever been too?